The estimable pianist Chucho Valdés continues with his "Jazz Bata" show, featuring a mix of jazz and Cuban folkloric elements, through Thursday at Jazz St. Louis. Also on Wednesday, this week's "Grand Center Jazz Crawl" features multi-instrumentalist TJ Muller and Friends at The Stage at KDHX, the weekly jam session hosted by bassist Bob DeBoo at the Kranzberg Arts Center, and trumpeter Kasimu Taylor at The Dark Room. Guitarist Dan Rubright of The Wire Pilots leads a quartet in a free concert of original music for the Jazz at Holmes series at Washington University. Also on Thursday, singer and multi-instrumentalist Tonina Saputo performs at Joe's Cafe, and St. Charles County's own 636 Big Band, directed by trumpeter Keith Moyer, will be playing at Red Fish, Blue Fish, located just south of I-70 in Hawks Nest Plaza. Saxophonist Melissa Aldana, pianist Emmet Cohen and trumpeter Marquis Hill (pictured, top left) will wrap up a week-long educational residency by joining forces for the first of two nights of performances at Jazz St. Louis. 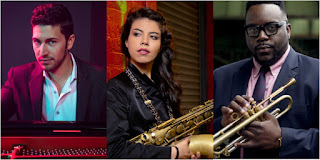 At ages 30, 28, and 32 respectively, Aldana, Cohen and Hill all could be considered among the top young players on their respective instruments now working mostly in the mainstream tradition, and all three are bandleaders in their own right. As is usually the case with one-off ensembles, it's hard to know how sympatico their individual styles may be until they actually hit the stage together, but on paper, these three seem like a good match. And if things are bit looser than they might be with a regular working band, listeners still will be getting three headliners for the price of one. Also on Friday, the Arcadia Dance Orchestra will be joined by special guest multi-instrumentalist Andy Schumm of the Chicago Cellar Boys for a show at The Stage at KDHX. 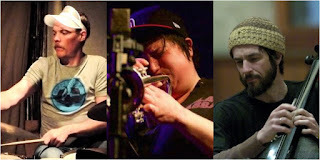 Though they're not a regular working band, the three have performed together before, which should provide just enough familiarity to ease them into an evening of freely improvised music. The concert also marks the St. Louis debut of Branch, a Chicagoan-turned-New Yorker who is one of the more noteworthy young trumpeters to emerge on the improvised music scene in recent years. You can find out more about her and see some performance videos, including one with Lonberg-Holm and Solberg, in this post from last month. 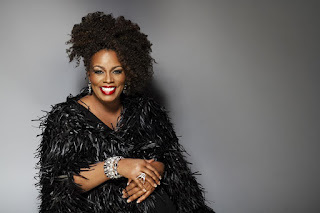 Also on Saturday, singer Dianne Reeves (pictured, bottom left) performs at the Sheldon Concert Hall. Generally acknowledged as one of the most accomplished female jazz vocalists working today, Reeves last year was named an NEA Jazz Master, a significant milestone in a four-decade-long career that fortunately shows no signs of slowing down yet. Reeves also has some musical connections to the St. Louis area, and you can find more about those and see some videos of recent performances in this post from last Saturday. Trumpeter Jim Manley plays for brunch at Evangeline's, while bassist/singer Janet Evra performs at The Dark Room. Then on Sunday evening, singer Will Downing will be in town for a "Valentine's Weekend Kick-Off" performance at Harris-Stowe State University, with St. Louis' Lamont Hadley opening. Dizzy Atmosphere returns to The Shaved Duck, and keyboardists Kim Portnoy and Nick Schlueter will team up for a duo concert at Webster University's Winifred Moore Auditorium.